A strict embargo on the area in Woodhill Forest, between Deacon Rd and Hucks Ave. The area is north of Otakanini Topu block as far as Deacon Rd which is parallel to the south end of Lake Kereta. This embargo applied until the event on 31st March 2018. 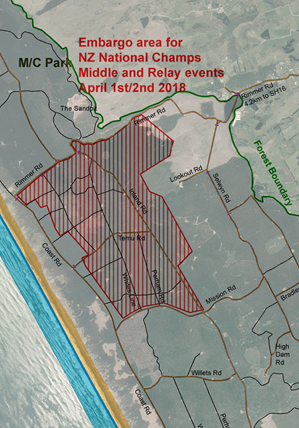 A strict embargo on the area of Woodhill Forest, south of Rimmer Rd to Mission Rd with the exception of a strip either side of Coast Road and an area south of Lookout Road. 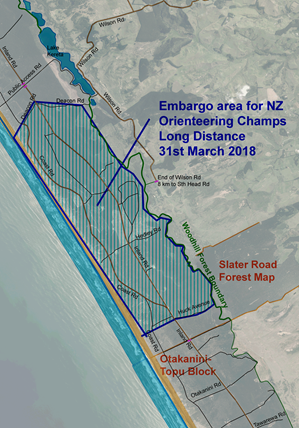 This embargo applies until the events on 1st and 2nd April 2018.